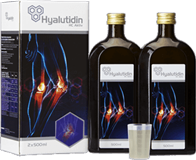 The price for one liter of the HYALUTIDIN HC Aktiv preparation is 190€. Packaging contains two bottles of preparatio (2x 0,5l) - together 1 liter net. The following study was conducted using of a dietary supplement Hyalutidin HC Aktiv. A group of patients was examined with restricted motor functions due to structural damage of the knee joint- second degree degeneration. Clinical research were carried out in cooperation with a Specialist Hospital in Vogelsang-Gommern (Deutsches Zentrum fur Knorpel - und Knochentransplantationen DZKKT/klinische Abteilung für Orthopädie - German Centre for Transplantation of Cartilage and Bones / Clinical Orthopedics Department). As an assessment tool, a WOMAC pain assessment questionnaire was used. The study used 2L of the Hyalutidin HC Aktiv fluid for drinking.